One new outfit - beautiful! Lot's going on this week although no trips to the doc or ultrasound. We were so happy about the mamaRoos from 4Moms that we decided to try their Cleanwater Infant Tub. [see here] It arrived yesterday from Amazon and we were immediately disappointed. It all started with a beat-up package and a scuffed up tub. This thing looked like it was a year old right out of the box. Julija kept telling me it was so flimsy and cheap. She tried to fit it in three different sinks (kitchen double sink; kitchen island single sink; laundry room wide sink) and it didn't even fit!! Wow. Last straw for me was that the electronics looked like walmart digital watches.... cheap. So -- it's boxed up and heading back to Amazon. 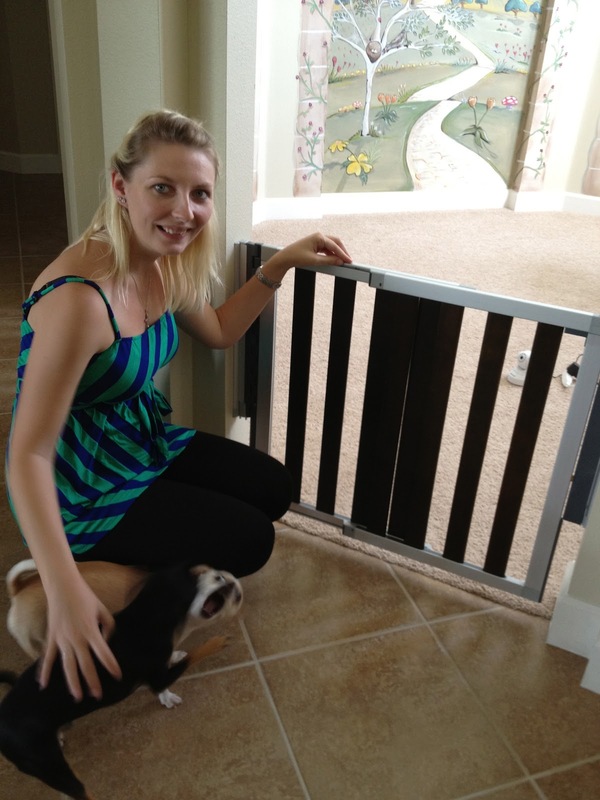 We also installed two new baby gates in the play room after months of engineering. The goal is initially to keep the dogs out, but ultimately it will be to keep the kids in too :) We ended up with the gate from Munchkin [click here and watch the video]. They installed easily and look great. We like the one-handed operation and that they open both ways. Very cool. Today was the big day though. I tool Julija to Destination Maternity at the International Mall in Tampa for some much needed clothes. I'll post a pic of one of her new outfits. She was very excited but really they are required :) Isn't she cool. Finally her belly is getting big. No doubt now that she's pregnant and lots of kid movements too. Yay. Monday morning will be our trip to the long 3d/4d ultrasound doc so we are very excited. Can't wait to see the babies.